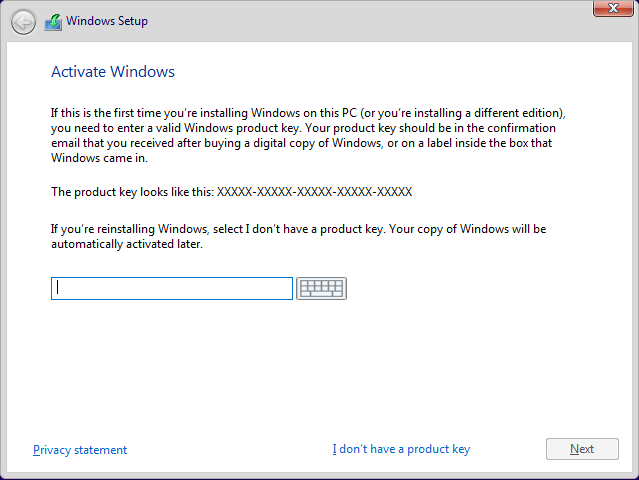 While installing Windows 10, you will be asked to enter the product key or license key. Depending on the key, it will either permanently or temporarily activate the Windows 10 system. If you don't have an activation key, you can still proceed with the installation procedure by skipping the license. All you have to do is click on the "I don't have a product key" link appearing at the bottom of the same window. However, there will be times when you are required to enter the product key or the skip license key link won't work as it should. In those situations, you can use the Windows 10 generic license key to install the operating system. The other benefit of using the default license keys is that it allows you to install a specific version of Windows 10. Do keep in mind that these keys WILL NOT activate Windows 10. Rather, just allows you to enjoy the trial period a little longer or install a specific edition of Windows 10. 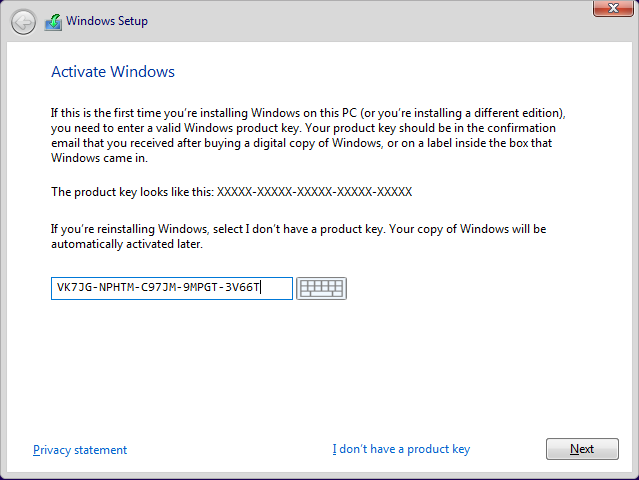 To properly activate Windows, you need to enter a genuine product key bought either directly from Microsoft or from a genuine authorized seller. Below is the list of generic license keys for all Windows 10 editions. Find the one you are looking for and use it as needed. These keys just allow you to install a specific edition of Windows or temporarily activate Windows. The below keys WILL NOT activate Windows 10 permanently. After looking at all the different Windows 10 Editions, you might be wonder what's the deal with Windows 10 N edition. After all, you will also see this edition while trying to download Windows 10 ISO from Microsoft. Especially the regular versions like Home and Pro. The Windows 10 N edition is mainly designed for Europe. In this edition, you will not find some built-in apps like Groove Music, Movies & TV, Voice Recorder, Windows Media Player, and Skype. That is it. First, insert the Windows 10 USB installer, and proceed to install Windows 10 as you would normally. In the license key page, enter one of the above license keys and click on the next button. If the key is correct, you will be allowed to the next step. Do keep in mind that you need to enter the corresponding license key. For instance, I've downloaded the Windows 10 Home and Pro ISO from the Microsoft website. So I need to use either the Home or Pro version generic key. I cannot use the Enterprise key. If you do use an unrelated key, the installer won't accept it. If you like this article, do check out direct download links for Office 2016, Office 2019, and Office 365 ISO and direct download links for .Net framework offline installers.